Deposit #1 - 300% match with a max value of $1000. Deposit #2 - 50% match with a max value of $500. Deposit #3 - 50% match with a max value of $500. Deposit #4 - 50% match with a max value of $500. Deposit #5 - 50% match with a max value of $500. Deposit #6 - 100 Free Spins (Minimum deposit: $0). All Spins Win Casino gives players a classic casino experience in one place where you can get all different types of table games, casino games, progressive jackpots and video poker all in one. All Spins Win is one of the newer Australian casinos to join the bunch and is somewhat different to what you may expect. It offers a sleek and refreshing baby-blue look and has a complete focus on pokies for players Down Under. There are still some table games and other types of specialty games on offer but it should definitely be your port of call if you’re looking for some slots. Along with the casino's incredible welcome bonus offering, the different kinds of games on offer and the quick and easy functionality of the site, you’ll feel right at home with All Spins Win Casino as an Australian player. 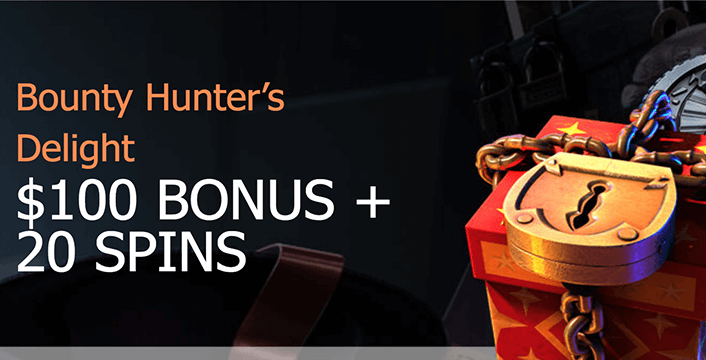 "Bounty Hunter’s Delight" is a one of a kind casino bonus where players are put in the driver’s seat and given a choice which could potentially determine their casino career future. All Spins Win Casino is powered by providers such as BetSoft, Saucify, iSoftBet and a few more. This means that the casino has a lot to offer players in Australia looking to play some of the top games around. You'll get access to hundreds of different slots that you may well have played some variation of before, but you'll also get different kinds of pokies like Vegas style slots too. The casino has a sortable menu on the very front of the page and lets you pick between popular, new and casino jackpot games. While the site is predominantly known for the pokies, you'll also be able to choose from a bunch of different table games, video slots and even add your own to favourites. You can also search for whatever slot you're looking for if you want something specific. As far as table games go, if you don’t happen to be in the mood for a round of cheeky pokies, you can try some different games. They offer games like World Football, Jolly Poker and Turbo Poker. You'll need to use the search function to dig deep into some of the more popular table games like blackjack and roulette though, but once you do, you'll find a nice variety there too. If you're a seasoned veteran in progressive jackpots and casino games that offer jackpots, you'll find that the site doesn't have any of the more traditional ones that you may expect at an Australian casino. There is a nice selection though and some of them are actually really fun to play. You'll get games like Absolute Super Reels, Mona Lisa Jewels and Neon Reels here. 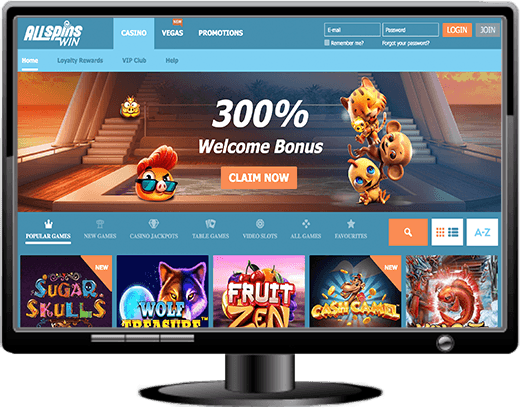 While All Spins Win does generally tend to focus more on a mobile friendly casino, and favours playing on the go, there is a lot of support for players looking for the more traditional gaming on desktop. You'll have to make do with instant play on your desktop though as there are no type of download games available to its users. As far as mobile goes, All Spins Win Casino supports almost any smartphone that our review team could get their hands on. Most of the All Spins Win Mobile games can be played on Android and iOS devices including smartphones and tablets. Furthermore, the mobile casino mimics the desktop closely as you will be able to enjoy nearly all the same features on both. You'll still get the same effect with instant play games having them loaded up in the browser of your mobile as there is no app. But that's okay because the site itself is heavily mobile responsive and makes life really easy when wanting to play. The All Spins Win mobile casino lobby is an easy one to navigate and the selection of games on mobile is quite plentiful. You won’t feel like you're missing out on anything when you swap from PC to mobile. In fact, almost everything on offer with All Spins Win casino on mobile is very well thought out. Some of the mobile versions of the games may lack a little polish here and there but that's true of all mobile games when you compare them to the desktop or PC counterpart. It's nothing new but really helps players to play games on their mobile without using too much data. You will also avoid making the phone too hot when it's processing too much at any given time. The progressive jackpots on offer at All Spins Win Casino are few and far between and are probably not one of the biggest selling points about the site. You'll miss out on some of the more popular ones from different providers but you'll still be able to earn big progressive prizes across the board. You can try the likes of Absolute Super Reels, Ultimate Super Reel, Mona Lisa Jewels and Super Lucky Reels. Many of the popular progressive slots here definitely have that old-school type of feeling when playing slots. There are a couple of new age pokies that offer progressive jackpots too including the likes of Skulls of Legend and Gold Hold. 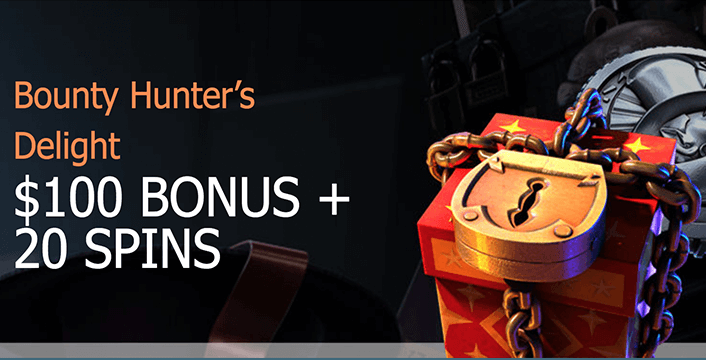 While there are some bonuses and promotions on offer with All Spins Win Casino, you won't find as many as some of the other traditional and more popular sites. You can get up to $3,000 and 100 free spins on your first five deposits, which, as a welcome bonus, is quite a substantial one. You'll also get access to a large % matched deposit bonus with your first deposit, as well as a bunch of new and fun tournaments on almost every day of the week where you can win huge prizes! All Spins Wins Casino does offer round the clock support to its users and you'll be able to get in contact with them through email or the live chat support. Both of these support options are available at the casino 24/7 but you won't be able to contact the casino telephonically. You'll also be able to browse around and read through the comprehensive FAQ page which should answer most of the common questions that you may have for All Spins Wins Casino. All Spins Win Casino offers a fair amount of deposit and withdrawal methods to customers and also allows players to deposit and withdraw in many different types of currencies, despite being largely aimed at players in Australia depositing in AUD. You’ll be able to use major debit and credit cards including VISA and Mastercard but will also be able to use eWallets too. You can use both Neosurf and uPayCard, as well as bank transfer for withdrawals, but there’s no mention of cryptocurrency yet on the site. As is usually the case with most banks, once you initial a withdrawal, there will be a lead in time for it to be processed and from there. This can usually take between 3 and 7 business days for most common banks. The eWallet procedures are a little better in that you’ll likely get your withdrawals back to you in a less than three days. The best part is that when you request a bank transfer from All Spins Win Casino, you won’t be subjected to any withdrawal fees. Therefore you can get all your real money transferred to you in a reasonable time frame without having to pay for anything extra. You’re allowed to cash out as little as $20 from your account with a maximum all the way up to $5,000. As a newcomer or new casino on the block, All Spins Win Casino caters to just about everyone looking to have some fun with pokies. You’ll also get to jump into some classic table games and some worthwhile progressives too. The banking options, while plentiful, leave a little to be desired as there is a limited amount of ewallets out there and they don’t yet seem to support cryptocurrency. All in all though, our review team feels that All Spins Win Casino is a great addition to your online casino life and you’ll struggle to find a place that’s as easy to use with the same amount of options as they offer across the site.